Yoursay: Which part of the law did CID chief not understand? Anonymous_1392781899: Bukit Aman Criminal Investigation Department (CID) director Wan Ahmad Najmuddin Mohd is not naive but smart. 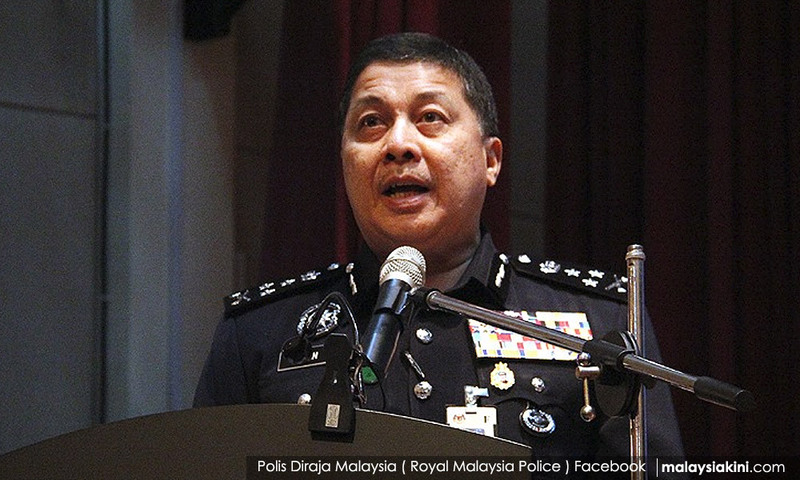 He knows the law as he is one of the highest officer in PDRM (Royal Malaysian Police). The way the money was transferred points to possible deception. This means he has no respect for the law in other countries. That he can forgo the money and continue to support his children’s education means he has lots of money. Can an officer earn so much money on his pay scale? It looks like PDRM pays their officers very well. Turvy: Tens of thousands of parents, who have sent their children overseas for their education, transferred their money from here. Many, and your heart must bleed for them, sell their houses to pay the high overseas costs. Australian banks recognise this large inflow of foreign funds and their procedures generally make the process easy for the parent and student. One call to Bank Negara or a visit to your local bank is all you need to find out how the transfers are done. If large sums are involved and your aim is only to support the student, the local bank can make monthly remittances. If the intention is to earn better interests, then there is a cost to transferring large sums. But it can all be done legally and easily from your local bank to the Australian branch concerned. Genuine transactions have the protection of law which also helps you to sleep soundly. If you are naive, the choice of action must be the legal one. Naivety does not lead one into shady transactions. That requires questionable intention. I think it is still possible for this “naïve” man to recover his money. Just write an account of what had transpired with copies of documents to substantiate the narration. If the bank's concern is money laundering, explain the source of funds - that this was the legit proceeds of a sale of a house. He may have broken other “minor” foreign exchange rules, but these he may only attract a fine. Get the advice of our own Bank Negara. Ending with a fine may save his, our police force's and this nation's pride and reputation. Not doing anything screams of all sorts of wrongs. Take the reasonable way out. The banks in Australia are only applying the laws of the nation. There is nothing personal. They are not vindictive. Remember, they have precedents of Malaysian officials' difficulty with Australian English. Good luck. Onlooker: Indeed, given that there are thousands of Malaysians sending money regularly to pay for their children's education in Australia, imagine the mess if all these thousands of people had to make these same complex arrangements on a regular basis. If you can account for the money in case the authorities ask you here, you just have to indicate on the Bank Negara form that it is for your child's education and if anyone asks at the other end, you'd have the receipts for payment to show that the money was used for the purpose intended. The fact that the money was seized and not used is a red flag, compounded by the statement that he's not claiming its return. Does his child no longer need the education? Naivety has absolutely nothing to do with it. Neither does common sense. Tholu: Zahid, instead of explaining to us that Wan Ahmad was naive on the Australian legal system, why don't you explain it to the Australian police and attempt to recover the money on behalf of your top police officer through diplomatic channels? Let’s see if they will buy your preposterous and ridiculous explanation. Otherwise, you should not have opened your mouth at all. With your attempt to defend your allegedly corrupted police officer what you have actually done is to make it clear to the Australian government and the Australian police that the Malaysian government has no honesty and integrity and has no shame in defending a law enforcement officer of our country who apparently has no professional morality and ethics. One million ringgit... Oh my God! He must be among the people in the rich and famous category (or a Malaysian government politician) to so easily forgo his hard-earned money (or is it “easy” earned money?). Abasir: Excerpts from the Sydney Morning Herald: "Wan Ahmad Najmuddin bin Mohd, now the head of Malaysia’s criminal investigations department, opened a Commonwealth Bank ‘Goal Saver’ account in 2011, listing his address at Bankstown and then Glebe in Sydney. One week after the decorated public official concluded an Australian trip in 2016, the account received a flurry of suspicious cash deposits. “Unknown depositors visited branches and ATMs around the country, from Biloela in country Queensland to Devonport in northern Tasmania to Lakemba in Sydney’s west and Melbourne’s CBD. The account balance grew by nearly $290,000 in a month, mostly in structured deposits below $10,000, the threshold above which law enforcement agencies receive mandatory notifications. “Since 2001, he has visited nine times, always on a tourist visa, often for less than a week and, sometimes, with lots of cash. Across three trips in 2011 and 2012 he declared $112,000 to Australian customs. It was on one of the 2011 trips that he opened an account in his own name at the Commonwealth Bank’s Haymarket branch in Sydney's CBD. “And in December the next year, one day after he arrived in Australia, $30,000 landed in the account (from deposits at Merrylands, Ryde, Strathfield and Burwood) while $8,000 was withdrawn at Haymarket. Analysing the constellation of transactions - 54 of which fell below the reporting threshold - the Commonwealth Bank and the financial crime tracker Austrac became alarmed. ‘There does not appear to be any apparent lawful reason for the form and manner of the deposits,’ an AFP officer from the Criminal Assets Confiscation Taskforce wrote in an affidavit." As for the "he-was-naive" defence spouted by the nation's "watchman", it is quite possible that all these fellows believe the banking and financial systems in Australia follow the same rules as the one managed by the Umnoised Bank Negara - one in which everything can be "kow tim" (settled) for a fee. And yes, the blackout of this scandalous affair by the so-called mainstream, state-controlled media simply means that Australia's "money laundering/criminal activity" suspicions are provable in court. Hence the top-level decision to forego the million ringgit. Vijay47: DPM, Wan Ahmad is a member of the police force and a senior one at that, it is highly possible that he is naive, a malady that seems to afflict some officers in MACC also. But I am not sure what deficiency you are referring to when you describe him as naive - is it being unaware that the Australian law requires transactions exceeding A$10,000 to get prior permission or was Wan Ahmad being naive in trying to slip one over the Aussies by keeping the transfers below the critical threshold? Is it the usual practice of Malaysian police officers to pull this trick when the simple process would have been to do it openly, especially since the source of funds was clean? Far more seriously, you and Wan Ahmad fail the first test miserably - he had made three trips over 2011 and 2012 where he had declared a total of A$112,000. So why did he not comply more recently? Perhaps he suffers from selective naivete, hence the gift of A$1 million to Waltzing Matilda. Negarawan: As correctly noted by many commenters, if indeed the money deposited (between 2011-2016) was meant to fund the education of Wan Ahmad's son and daughter in Australia, there was absolutely no need to do so in such a complex manner from Australia. He could have just transferred the money from Malaysia (proceeds from his house sales) to Australia and declare it to the bank as funds for his children's studies and submit the necessary documents from the schools as proof. He can't be that "naive". This is how millions of Malaysian parents send money overseas for their children's education. Another perplexing question is why no money has been withdrawn so far from the account to pay for the alleged education? Surely both his children have started their studies in Australia, or even completed them by now? Abd.Karim: If the money was brought into Australia in cash then something is really fishy. Money from the sales of a house in Malaysia would normally be deposited into a local bank. From there, it could have been easily transferred to Australia with Bank Negara approval. So why did this happen? HaveAGreatDay: Long ago, as a young room tenant and when radio and TV licences were a requirement, I was told ignorance of the law is no excuse in a court of law. Wan Ahmad is the country's CID chief and DPM Ahmad Zahid Hamidi said he was "a little naive on the Australian law"? Give us a break, please. Bluemountains: Pandan MP Rafizi Ramli can now claim to be naive of Banking and Financial Institutions Act (Bafia) when he disclosed another person's banking details. His lawyer can now quote the DPM in Rafizi's appeal. If naivety can be used as the reason to exonerate the CID chief, surely it can be used to exonerate Rafizi too.